True story: My wife bought a bunch of party favors for a family gathering. These were rolled up gift wrapping containing some cheap present. 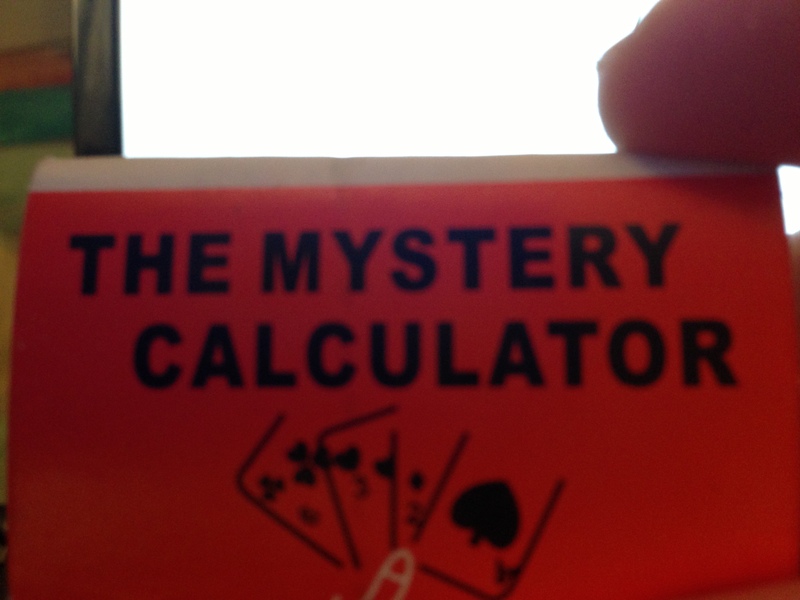 She opened on and found a party game labeled “The Mystery Calculator”. She gave it to me. This is what it is: A small folded cardboard mini-booklet of 6 cards of 4×8 arrays of numbers, ranging from 1 to 63. Here are the rules to the game. Show the 6 cards to a friend. Ask him or her secretly pick any number from any card. Tell them to look through the 6 cards and find those cards that the number they selected also appears, and give those cards to you. You add the numbers in the upper left-hand corner of these cards. This sum will be the number your friend selected. I haven’t proven this works but my guess is that this is based on the mathematics of the Hamming code of length 6 (see this previous post and this one). This entry was posted in math and tagged error-correcting codes. Bookmark the permalink. It works, since all number appear only on the cards that correspond to the bit in a 6 bit number. The cards are numbered 1 2 4 8 16 and 32 I presume. This is just based from the binary system and it works. There is also a variation out there that use the Fibonacci sequence instead.